The EPIC Small Production Freeze Dryer is the perfect unit for small scale production. It offers up to 30 sq ft of shelf area with a condensing rate of 40 Liters in 24 hours. With these specifications the price and performance of the Epic Small Production Freeze Dryer beats anything in its class. Standard features include PC/PLC controls for data collection, self-testing features (automatic freeze-drying, defrost, and system and leak rate testing. Additionally, remote connection is available to allow for a simple troubleshooting and customer services with customer approval. In addition to our standard features , advanced system options include: FreezeBooster® Controlled Nucleation, Auto-Dry™ Protocol Optimization, AccuFlux® and CIP. This combination provides the ideal platform for simplified and optimized protocol development. We have addressed common application issues in our design with features such as; more accurate vacuum sensors, no rubber hoses, no vapor flow choke points, superior shelf temperature uniformity, reduced shelf temperature transition times, increased stoppering pressure, and more to ensure that the equipment is not a limit to your freeze drying needs. The EPIC Series comes complete with PLC controls and a PC for programming and data collection. 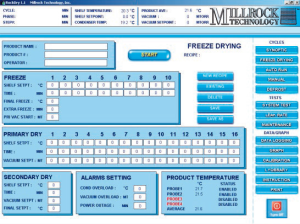 Our easy-to-use software provides automatic freeze-drying, defrost, and system test. Data can be printed either numerically or graphically. This same control system can be used on industrial dryers, allowing scaling to production. 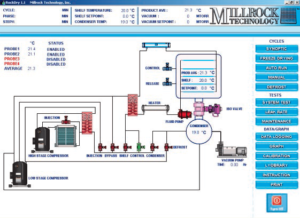 An interactive maintenance screen simplifies component servicing. 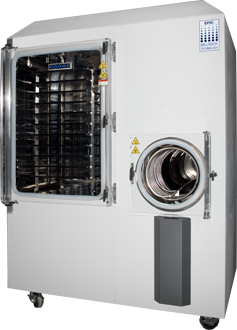 Visit our main freeze dryer page for a complete list and comparison of all our Freeze Dryers.